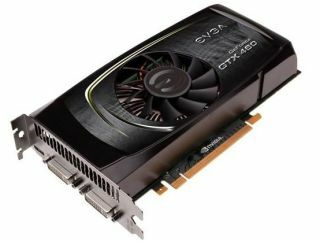 EVGA has announced its GeForce GTX 460 graphics card, utilising Nvidia's latest GTX 460 GPU. EVGA's GeForce GTX 460 has been built from the ground up to take advantage of DirectX 11, using the latest mid-range GPU. "The EVGA GeForce GTX 460 brings next generation gaming performance and features to new price levels," said Bob Klase, VP of Sales at EVGA. "Now everyone can experience the ultimate gaming experience with Nvidia 3D Vision Surround, PhysX and DirectX 11 done right!" EVGA GTX 460 has a UK release date of right now, and there are four flavours – two vanilla and two 'SuperClocked' versions.